Sunday’s column is a grab-bag of items, starting with one in which we revisit the defunct Raku store, whose sign, improbably, remains up even though a new tenant occupies the space. 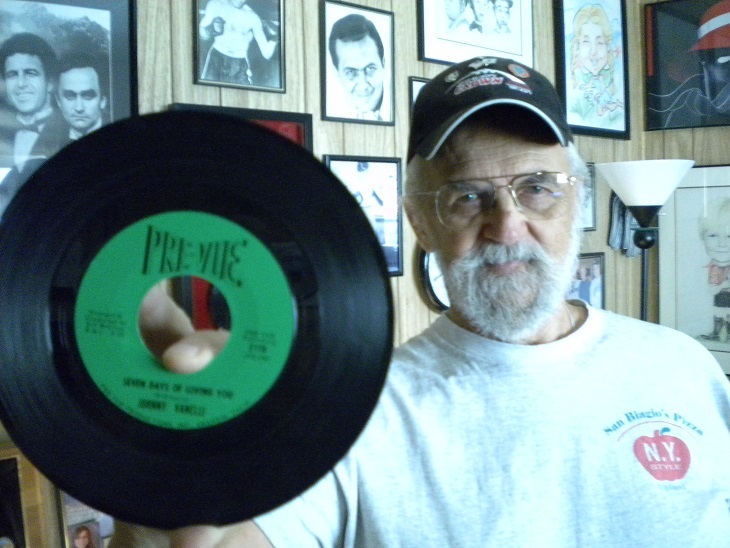 Above, Dominic Di Giamarino of Upland with an original copy of “Seven Days of Loving You,” a song he wrote in 1968 that has found minor renown in England among fans of what’s called Northern Soul. My Friday column tells the strange story. You can hear the song via YouTube here. Grinders, for the uninitiated, are submarine sandwiches rather than suggestive dances at the Video Music Awards. This Chino shop gets decent ratings on Yelp, so I sought it out for lunch. 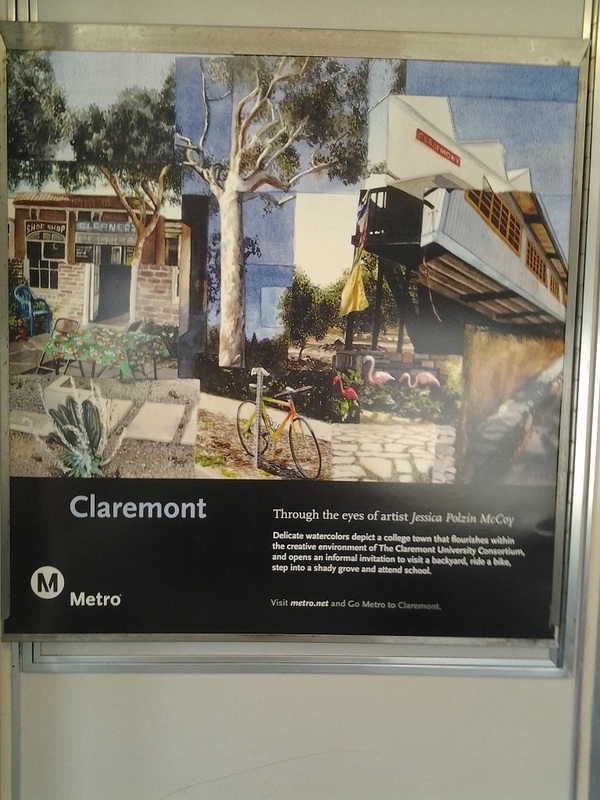 It’s in the Superior Market center just below the 60 Freeway, east side, across from the Post Office. 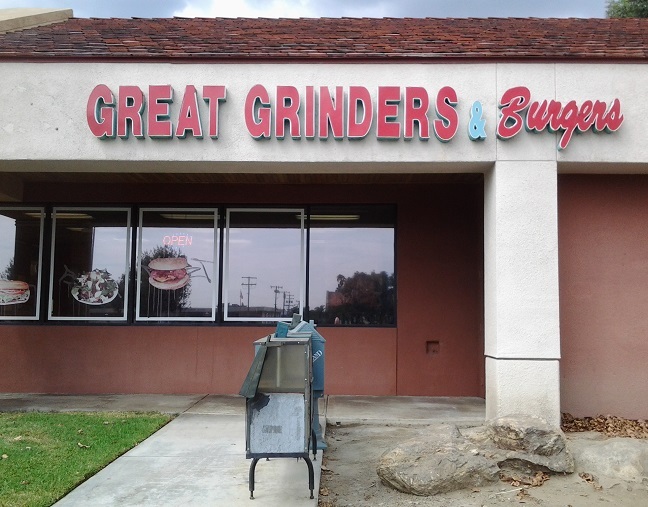 They have hot grinders (the comment above still applies), cold sandwiches, burgers, salads and teriyaki. I asked the best items and was told the pastrami sandwiches, char-broiled burgers and grilled chicken salad are the most popular. I went for the pastrami, as a combo with chips (or fries) and soda ($8.63 with tax). 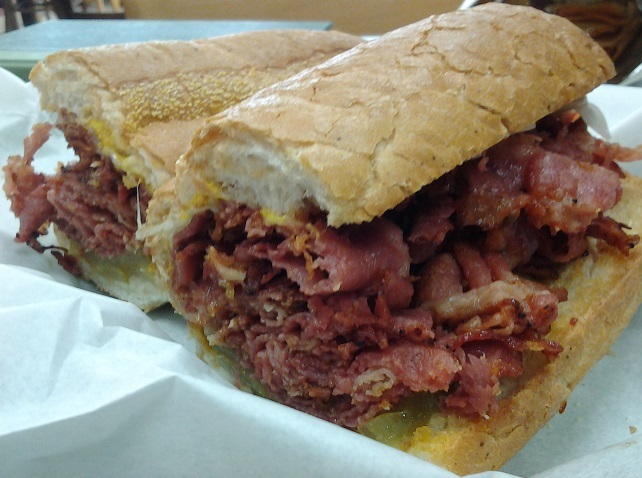 The sandwich, with mustard, pickles and provolone, came on an 8-inch roll, the pastrami flavorful, the roll crusty. Tasty. Great Grinders’ decor is standard sandwich shop, although the Seattle Mariners poster was an unexpected touch. The TV played “People’s Court,” where a plaintiff won a judgment of $1,250 against his lying ex-roommate. Justice prevailed. 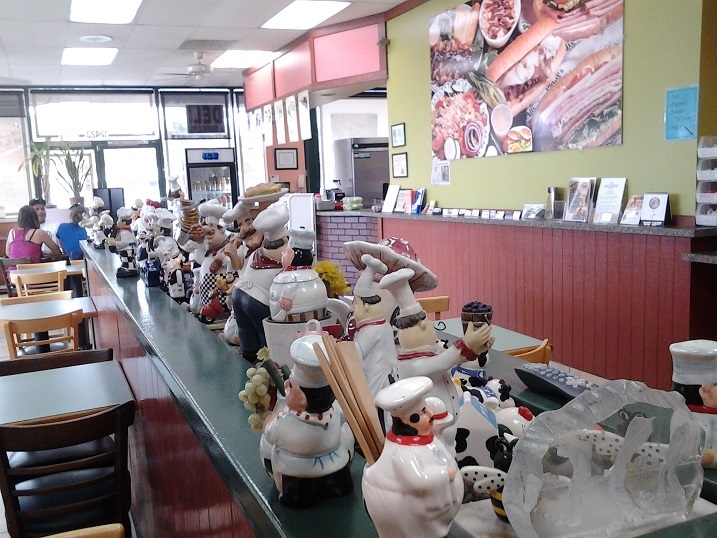 A divider between two rows of tables is topped with a long row of ceramic figures of chefs, more than 50 in all. It’s a personal and unusual touch. Not a bad lunch spot. LA County Fair: Barn owls, bacon and mermaids, oh my! Can you believe the L.A. County Fair begins Friday? Yep, it runs Aug. 30 to Sept. 29. I preview the highlights in my Wednesday column. But when in the week? My Restaurant of the Week feature was traditionally found here on Fridays, probably because some weeks it took me until Thursday night to find time to produce it. Recently, though, I moved the feature to Thursdays. My logic was that posting it Friday around lunchtime, and sometimes forgetting to post the link to Facebook until mid-afternoon, was perhaps not the most useful approach. Also, I already gave you a column to read that morning, and maybe a blog post at mid-day was too much of a good thing. I don’t know that I’ve asked this before, so let me put it out there: I’m curious how you use these Restaurant of the Week features, if you use them that is, and if Thursday works for you or if you’d prefer a different day. Any other feedback is welcome too, as are questions. Sunday’s column has a variety of local and cultural items, beginning with a tale of two parking tickets. Two enormous cargo planes have been parked at Ontario International Airport for two weeks, near Airport Drive. I take a closer look, and also learn more about the filming that takes place often at the airport, in Friday’s column. Owned by the same family that has Juanita’s III in Ontario at 1209 E. 4th St. (since 1983), and related to the Juanita’s in Pomona at 1735 Indian Hill Blvd. 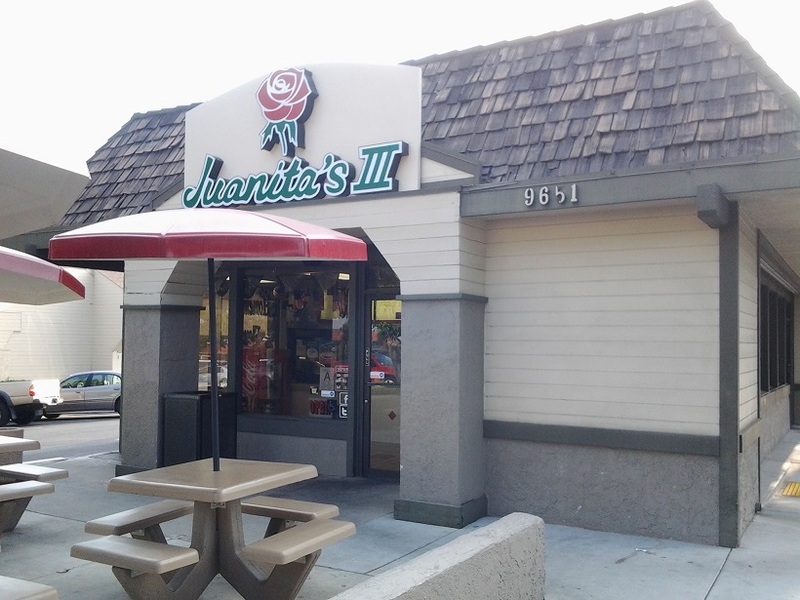 since 1976, this Juanita’s opened in 2011 in a converted Taco Bell in the Baseline Village center. On my first visit I strayed off the reservation for some reason and tried the cheese enchiladas, a brutalist version under a river of melted yellow cheese. They were okay for what they were, but not something I’d recommend or order again. 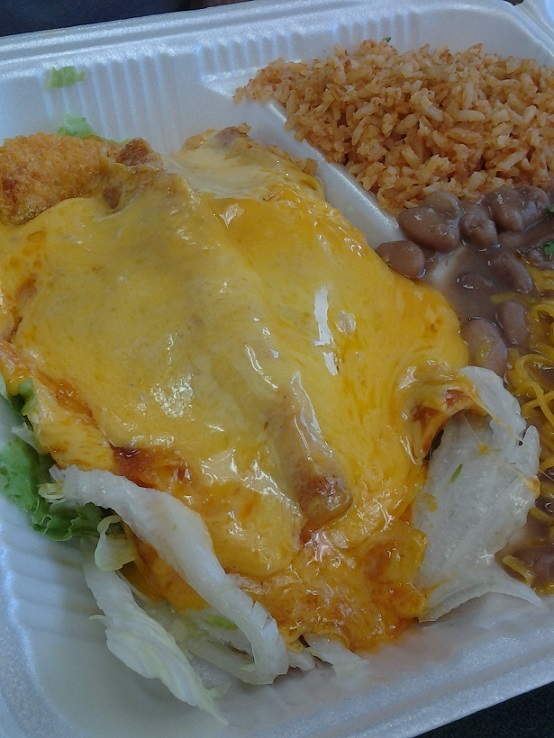 Next time I reverted to my Juanita’s usual: a chicken, rice and cheese burrito ($5.25) and a small horchata ($1.45). Much better. They make their own flour tortillas and it shows. The burrito was carelessly wrapped, although the fact that it fell open when unwrapped did facilitate adding dollops of their excellent red salsa to the main body of the burrito instead of a bite at a time. Not the most authentic Mexican food around, but Juanita’s burritos make a satisfying meal. It’s a big improvement on Taco Bell. Wednesday’s column pays tribute to Lois Robbins, the children’s librarian at the Pomona Public Library, who retired Saturday after 23 years. The children’s room blog that she wrote can be found here.